Researchers create new optical technique to detect molecular chirality. A University of Central Florida team has designed a nanostructured optical sensor that for the first time can efficiently detect molecular chirality – a property of molecular spatial twist that defines its biochemical properties. Determining chirality is critical for new drug development. Think of molecules as having little hands. They are not identical, but they serve almost indistinguishable functions. You can grip, pinch, punch and open your hands, regardless of whether you use your left or right hand. But when you get to some functions, such as writing, it matters if you are right-handed or left-handed. Scientists have struggled to determine if molecules have unique left- or right-hand functions because their physical attributes such as length, weight, density and elasticity appear to be identical. 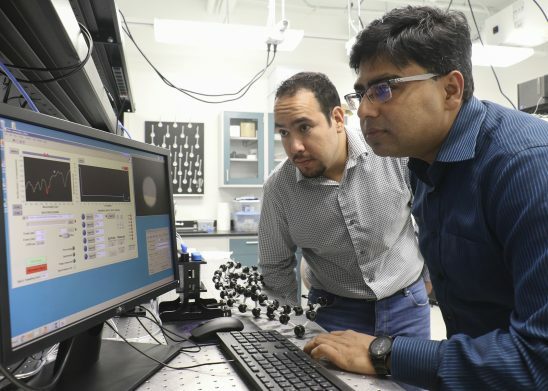 UCF’s NanoScience Technology Center Associate Professor Debashis Chanda and Ph.D. student Abraham Vazquez-Guardado have figured out a unique way to do it. The interaction between light and the specially designed nanostructure they built creates a strong chiral light field – called superchiral light. Such a nanostructure does not have geometrical chirality yet it creates two opposite light chirality (left or right) on demand. When light and matter’s chirality match, just as handshaking with our right hand, successful identification happens. Therefore, this rotating light field has the ability to probe and identify any chiral molecule such as drugs, proteins or DNAs. The light field lets scientist see the tiny hands, so to speak. Their findings were recently published in the Physical Review Letters journal (PRL, 120, 137601, 2018). By being able to detect chirality at this level, scientists will have a better way to identify what may be causing bad side effects or perhaps finding places to upload life-saving drugs. In this preliminary study, the UCF team demonstrated chiral molecule-detection sensitivity that is four times higher compared to the conventional technique, but without the extensive and tedious sample preparation and at much lower sample volume. 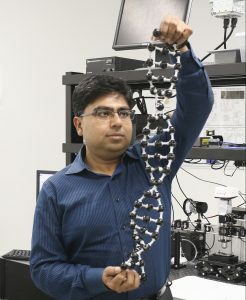 The single optical element thin-film chirality sensor, when fabricated based on low cost and large-area nanoimprinting technique, will immensely benefit drug design and protein-conformation identification, both of paramount importance in treating and understanding several diseases, Chanda said. The Florida Space Institute/NASA, Northrop Grumman Corporation and the Defense Advanced Research Projects Agency help fund the research.